The common cold (also known as nasopharyngitis, rhinopharyngitis, acute coryza, head cold, or simply a cold) is a viral infectious disease of the upper respiratory tract which primarily affects the nose. Well over 200 virus strains are implicated in the cause of the common cold; the rhino-viruses are the most common. In adults, a fever is generally not present but it is common in infants and young children. A cold usually begins with fatigue, a feeling of being chilled, sneezing and a headache, followed in a couple of days by a runny nose and cough. From the time a cold virus enters the nose, it takes 8-12 hours for the viral reproductive cycle to be completed and for new cold virus to be released in nasal secretions. This interval is called the incubation period. 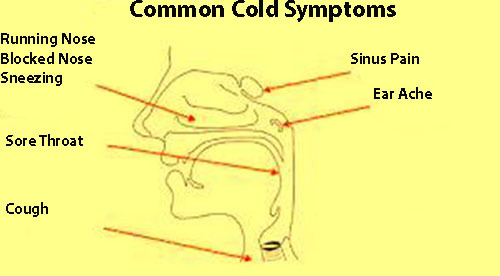 Cold symptoms can also begin 10-12 hours after virus is first produced in the nose. The time from the beginning of the infection to the peak of symptoms is typically 36-72 hours. They usually resolve in seven to ten days but some can last for up to three weeks. The average duration of cough is 18 days and in some cases people develop a post-viral cough which can linger after the infection is gone. In children, the cough lasts for more than ten days in 35–40% of the cases and continues for more than 25 days in 10%. The first symptom of a cold is usually a sore or irritated throat. Yes, Common Cold is Contagious. Common Cold may be contagious just before symptoms appear and after they have begun to fade, but the period of highest contagion is when you’re experiencing the strongest symptoms, that’s when the cold virus is at its highest level in your body. Some people will continue to have symptoms such as congestion or a sore throat after they are no longer contagious. Colds are usually transmitted by exposure to an infected person’s mucus; either from surface or skin contact, cold viruses can live on skin for three hours and other surfaces up to four hours. The common cold is spread when you inhale virus particles from an infected person’s sneeze, cough, speech, or loose particles from when they wipe their nose. You can also pick up the virus by touching a contaminated surface that an infected individual has touched. Common areas include doorknobs, telephones, children’s toys, and towels. Nasal congestion, sneezing, a runny nose, and coughing are all classic signs of a cold. Usually you don’t need to see a doctor for a cold. But if your symptoms continue, it’s important to see your doctor. A healthy immune system will fight the infection and symptoms will usually clear up in 7-10 days without any treatment. There is no cure for the common cold. The common cold is a self-limited illness that will resolve naturally with time and eager management. Home remedies and treatments are directed at alleviating the symptoms associated with the common cold while the body fights off the infection. Home treatment for the common cold includes getting rest and drinking plenty of fluids. In older children and adults, over-the-counter medications such as throat lozenges, throat sprays, cough drops, and cough syrups may help relieve symptoms, though they will not prevent or shorten the duration of the common cold. Gargling with warm saltwater may help those with a sore throat. Decongestants such as pseudoephedrine (Sudafed) or antihistamines may be used for nasal symptoms, while saline nasal sprays may also be beneficial. Painkillers such as ibuprofen, paracetamol and aspirin – which are the only type of medication known to be effective in treating colds. Children under 16 years old or breastfeeding women should not take aspirin. Decongestants may have limited effectiveness against colds. However, don’t use them for more than seven days because overuse can make the symptoms of congestion worse. Children under six years old should not use decongestants. Eat lots of vitamin-rich fruit and vegetables regularly so that your immune system remains strong. When sneezing or coughing make sure it is done into a tissue. Discard the tissue carefully and wash your hands. If you sneeze into your hands make sure you wash them with soap and water immediately. If you have no tissues or a handkerchief cough into the inside (crook) of your elbow rather than your hands. Wash your hands regularly; cold viruses can be transmitted from one person to another by touch. Keep surfaces in your home clean – especially in the kitchen or bathroom. Avoid touching your face especially your nose and mouth.